Primark occupies Fred Meadhurst’s Department store, the name being visible high above the central entrance. Medhurst’s was a drapery shop, first occupying numbers 49 and 50 in the High Street, which was started in 1879 by Fred Medhurst. The business was so successful that successive adjoining shops were bought as they became vacant, from 1879 onwards, expanding the business until it took up a large part of the west side of the High Street. Eventually, Medhurst’s had this fine Art Deco /classical style department store built, in 1930, and traded as a family-owned business until it was sold to a large chain in 1969. 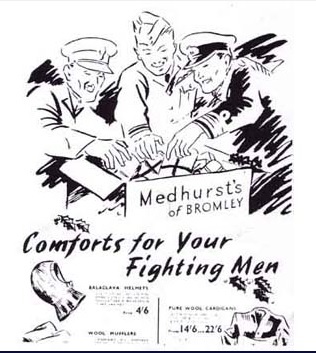 Medhursts was a household name in Bromley by the 1930s, with some of the staff, milliners and dressmakers living on the premises. The store front has changed little to this day, and the old name is still just visible, carved high up on the stonework. The store then became Allders, and is now occupied by Primark. This entry was posted in Uncategorized and tagged Heritage Buildings, High Street, LBB-Bromley-North-Trail, Market Square. Bookmark the permalink.